What’s the next best thing to seeing “The Hammer” on the big screen? How about watching the movie in the comfort of your own home for as many times as you please? The DVD is available in stores today for only $13. Based on the life of former UFC light heavyweight Matt Hamill, “The Hammer” is a coming-of-age drama about the deaf wrestler’s journey to winning a National Collegiate Championship. Through sheer grit and determination, Hamill turns what could be a disability into an asset, and in the process, serves as an inspiration for all. 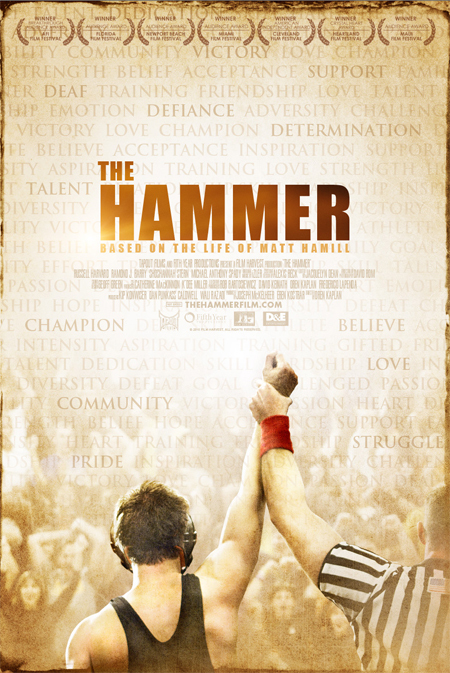 “The Hammer” was the recipient of The AFI Film Festival’s Breakthrough Audience Award, the Cleveland Film Festival’s American Independent Award and the Heartland Film Festival’s Crystal Heart Award. It also received awards at all eight film festivals, including the Audience Awards at Newport Beach, Florida, Miami and Maui Film Festivals. The movie stars deaf actors Russell Harvard as Matt Hamill and Shoshannah Stern as Kristi Hamill. Oren Kaplan made his directorial debut. The show initially hit the silver screen this past October 27th.